As a lifelong bibliophile, there’s something I do when life is a little rocky, or when things are great and I want to save some happiness for a rainy day. I get a book that I feel certain I’ll love and put it away. When everything is going wrong and the world is crashing about my ears, I slip off and read a novel. Sometimes that means I hide it in the bathroom and read five minutes at a time for days, but usually it means Husband takes the kids (bless him) and I get to immerse myself in the world of the book. Corinne Duyvis’ On the Edge of Gone is one such book. I’d read some of her short stories and non-fiction, so I knew this would be just my kind of book. I saved it for a considerable time after purchasing, just so that I would have the joy of immersing myself in the novel after a long, challenging day. I loved the fact that even here, on the most welcoming and inclusive inter-generational ship ever seen in science fiction, Denise points out that it’s mostly white people, while the overcrowded and failing shelter where people are slowly starving to death has many people of color. Of course I don’t love that it’s happening, but it’s so refreshing to see someone point that out. Duyvis did fall into the classic white person’s trap of not always specifying the white character’s race, but she otherwise did a good job of skillfully working diversity into her book. Honestly, she rocked at making this book diverse in so many ways. Duyvis is not just an autistic #ownvoice, she is a powerful ally, and she loaded this book up with so many little Easter eggs for diverse book readers. This was not done gratuitously or forced, just naturally worked into the plot and action. “We went [spoilers] together, but he and his partners went back.” page 394. There’s a bit more to this passage (but it occurs late in the book and could be a spoiler), but basically, the inclusion of that ‘s’ in ‘partners’ is crucial. Personally, I’m very monogamous with a single partner. But those who aren’t? They almost never see themselves casually mentioned in a regular, mainstream book. Some people might not enjoy that at some points, a character in power makes ablist statements about Denise. He is generally regarded negatively, and in one case his statement is contradicted by Denise’s actions, which prove him wrong. But the text does not challenge him directly. This didn’t bother me given that the whole book is a promotion of diversity and anti-ablist. It’s realistic that some people are ablist, especially in a high-stakes life or death situation which tends to bring out the worst in any person. The novel had a very interesting format. Having read the Disability in Kidlit review, I already had some idea of the general plot but was so excited that Denise is biracial – her mother is Dutch and her father is Surinamese. She’s been raised in the Netherlands but is aware of her heritage from both sides of the family. At 456 pages, this novel is a bit epic, fitting for a tale of the apocalypse. The setting itself is gripping, but I also kept reading because the character of Denise is fascinating as well. Her tenacity, her thought process, and even her inevitable shutdowns and meltdowns, make for a real and intriguing hero. The way in which Duyvis resolves the plot – I was so pleased at the ending despite being very tense as I read. Somehow she manages to bring an appropriate resolution to the disparate threads of the story, which surprised me even though it made sense. I also enjoyed how Denise was able to find her place and her power, both as a contributor to her final community and more importantly, by finding her own resolution to her relationship with her mother. I also enjoyed the very subtle, slow-build potential romance. Insta-love annoys me so much, and a slow burn, undefined love story is much more my style. The minor characters of the Muslim couple also made my heart happy. And in the beginning of this epic novel, when Denise and her mother are helping Ms. Maasland and she mentions her wife, I had to go back and reread to double check that I’d read correctly. The first couple we meet are a married lesbian couple. Fabulous. If you like science fiction, this is a clear example of great YA sci-fi. I wish every book was this inclusive. Recommended so much I already told a few people they have to go buy their own copy because they’re going to like this so much I won’t get mine back if I lend it. This will be reread. This sounds good. I think I’ll get this because I am in need of more biracial characters! Great review! I’m excited to hear what you think of it, especially her experiences as a biracial European! Looking back, the only other biracial books I’ve read have been Brendan Buckley and Born a Crime, so this was definitely past due. This sounds great. I’m not a regular reader of sci fi, but I’m not averse to reading it, especially when the book features diverse characters and themes. Great review. Sorry it took me so long to respond. Thank you. 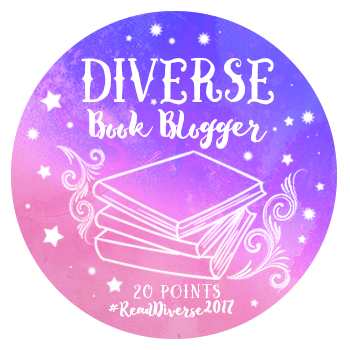 I think this was the most inclusive book I’ve ever read – there was at least a mention of every possible diverse group and most of the characters were diverse in at least one way. I’m not sure how well it will work if you’re not a regular sci fi reader (many references to classic tropes turned on their head) but hope you enjoy it.